Way back before the 1400's when Batholomew Diaz and Vasco da Gama made their voyages of discovery around the Cape there were people living in Southern Africa. It was these people that the early visitors to the Cape came across when they came ashore. In the early centuries in Africa there were three main groups of Bantu speaking peoples . The first group being the Equatorial and Interlacustrine people who lived in the area between the Great lakes of Africa. These people took their names from their fathers. The second group were the Central Bantu people who inhabited the central part of Africa from the Atlantic in the west to the Indian Ocean in the east. Their family names came from their mothers. The third group are the Southern Bantu who occupied the entire area to the south of the Central Bantu group. 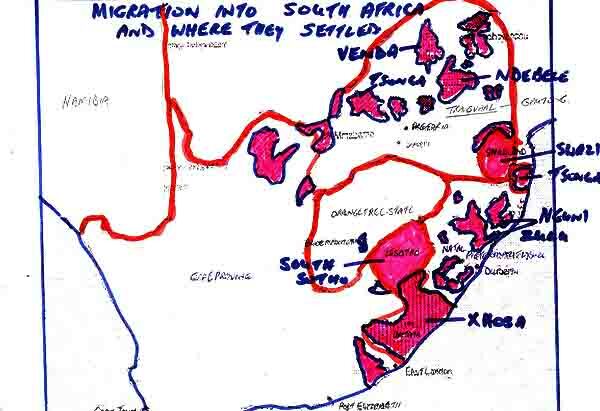 This group of people migrated southwards and arrived in South Africa in at least four large migrations which gave rise to the divisions between the peoples now currently living here. The various groupings are as follows: The Nguni, Sotho-Tswana,Tsonga and the Venda. "The Central Nguni or Zulu speaking people"
The ancestors of this group entered the Kwa Zulu Natal area from the northeast in A.D. 1500. and eventually came under the rule of Shaka who was assassinated by his half brothers in 1828. Today this group of people are split into four identifiable groups. "The Southern Nuguni or Xhosa speaking people"
These people today live in the eastern Cape in the former Ciskei and Transkei. They can also be divided into two groups, the first being the refugees from Kwa Zulu Natal and the second group were the Khwe-Khwen who were migrating eastwards from the Cape at that time. The third sub group is"
These people live in Swaziland. Their origins are shrouded in mystery. Today there are two groups of Ndebele people. One group lives in the Limpopo province and the second group lives in Mpumalanga province. The two groups are seperated by the Springbok Flats. The Tsonga people lived in the Mozambique area and were already resident there when the early Portuguese explorers arrived in the 1500's. Due to wars with the Portuguese and fighting between various groups the Tsonga tribes eventually split up and formed two groups. Today one group lives in South Africa while the other group lives in Mozambique. The Vendas are another group and are regarded as the last of the Bantu speaking peoples to enter the area south of the Limpopo River. They live in the area between the Soutpansberg and the Limpopo River. This group of people is made up of three different components. The Ancient substratum which included the Balea, Ngona, Mbedzi, Lembethu, Ndau, and Thwamamba groups. The Balea people are known to have mined iron in Phalaborwa and copper in Musina. Due to attacks from the Ndebele tribes the Balea group was destroyed and has now integrated itself into the Venda tribes. The second component is the Venda proper who are the direct descendents from Venda clans that migrated southward over the Limpopo River from Zimbabwe. The third component of the Vendas are the Lemba's. They are regarded as descendents of Arab traders who entered Africa from the East coast around 696 AD and mainly kept to themselves thus preserving their identity. The next main group of peoples are the Sotho-Tswanas. The ancesters of this group of people entered the area south of the Limpopo in several migrations and spread themselves out over the interior plateau between the Eastern escarpment and the arid regions in the west. The Sotho-Tswana's can be split into four main sub divisions namely East Sotho, West Sotho, North Sotho and the South Sotho. The East Sotho and the North Sotho peoples are today being regarded as one entity as the east Sothos have over the years lost their distinctive characteristics. The last group are the South Sothos who live in the mountainous kingdom of Lesotho and also in three provinces in South Africa namely Eastern Cape, Orange Free State and KwaZulu Natal. While the black tribes were migrating into the eastern parts of South Africa the San Groups were also making their way down the west coast and eventually arrived in the Western Cape with their cattle and sheep. When in the early 1400's the Portuguese explorers started arriving on the South African coastline it was the San peoples that they met up with. Life for the San took a downward turn with the arrival of the Dutch. As their influence took hold of the Cape from 1652 onwards the San peoples came under increasing pressure as there lands were taken over by the Dutch Free Burgers. The San peoples were forced to move on and started migrating along the southern coastline towards the east. This eventually brought them into conflict with the black tribes who were living in the Eastern Cape and they were forced to move inland to drier areas such as the Kalahari desert and their eventual demise. Today there are just a few San people left in South Africa. 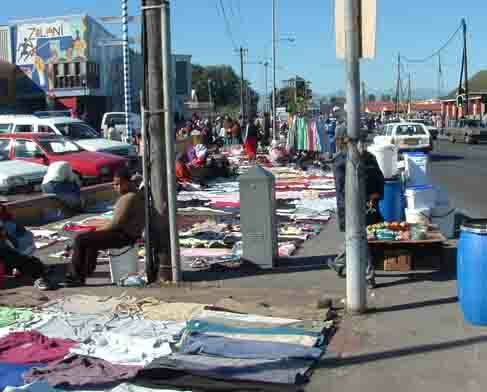 Traditionally the Western Cape has not been inhabited by black people in large numbers. This is however changing at a rapid pace as a migration is currently underway. Black people from the Eastern Cape and other parts of South Africa are moving into Cape Town at a rate of about 50000 people per month and with no housing available for them are building shacks on any piece of open ground they can find. This influx is causing the local authorities major headaches as they strive to house the influx of people. 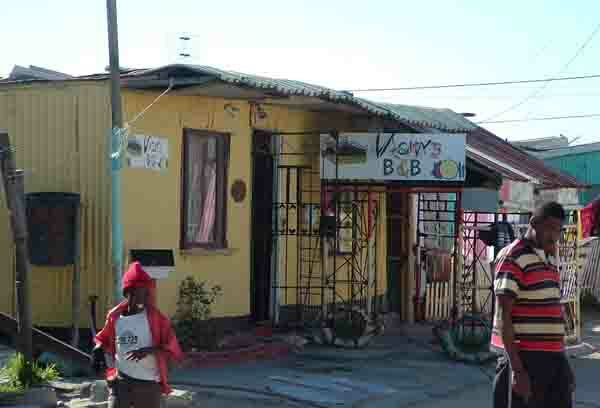 The Cape Flats has taken the brunt of the migration and as more people arrive more and more squatter camps are springing up in other areas of Cape Town as well. Cape Town authorities will soon have to take some major decisions as to how they are going to control the influx of people as the infrastructure in Cape Town is already taking strain. Cape Town is starting to experience gridlock on its roads, power cuts as electricity supplies are shared out and water shortages due to the lack of rain. Why not visit Cape Town and witness the current migration for yourselves.